Forget about the complicated details. What makes a bell a bell? Just its sound: ding-dong, ding-dong. The box on the right gives you a nice example. Zen riddles seem to be complicated questions about everything. Forget about logic and jump intuitively out of the riddle. That's it! The answer of the riddles doesn't matter: say something creative, the mad the better. Done. 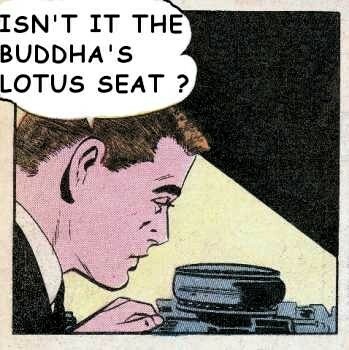 There are only a few rules for answering Zen riddles which are sometimes called Zen Koans or Buddhist koans. 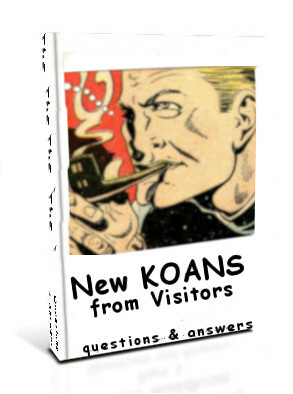 You'll find riddles or koans of readers and my answers at New Koans. Dealing with the famous 48 Koans of Mumonkan is basically no different from finding solutions for the ancient Zen-Koans from China further down. You want to have a personal questions answered, or a riddle or a koan? Go to Free Zen Riddle and Koan Service. I'll send you an answer by e-mail. "Cut a tree five hundred miles away from you. Cut it right now!!" Right. Zen koans ask for the impossible to be done on the spot! The solution has to be as mad and paradoxical as the riddle is. Let's try a mad reaction to the cutting tree riddle: "Great job. Let's have a beer!" 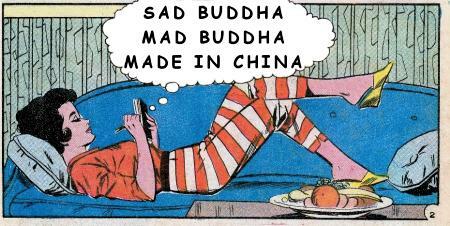 That's a multi-purpose reaction to many Zen koans. Unfortunately some people, especially Zen masters, may not want to have a beer with you. That's sad, but that's how they are. Okay, to satisfy those guys who can't accept your creativity there is a "way of the rules". 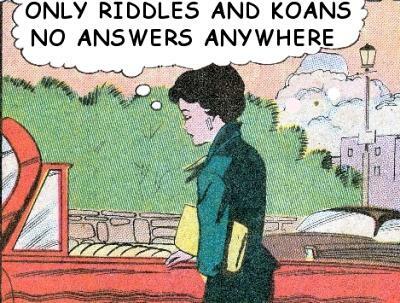 First rule to solve Zen koans: Look for THINGS, mentioned in the riddle. Second rule: Look for ACTION mentioned in the riddle. Third rule: Look for the uttering of HOLY actors. There's no holiness in the riddle above, but a tree, a saw or an axe are "things" and cutting is an "action". Move your hand with the saw back and forth and hum while cutting the tree. This time the Zen master smiles thinly and nods. Now you've a good chance to go for the next Koan or for some Zen practice at Meditation Hall. Besides madness and rule-driven solutions there other more simple Koan answers. On the cutting the distant tree riddle just say: "Yes, a tree is green" or move your arms like branches of a tree. Let's try another Koan, a dog riddle: Why did your dog bark throughout the night? Stupid question. Who knows why a dog barks? They bark, that's all. But Zen riddles are not about explaining, but about the madness of everything. "Let's have a beer", is again a good solution to the barking dog riddle. But as I said, not everybody appreciates creativity. Bark yourself, walk on hands and knees, lift one leg and piss, that may be more acceptable. Why? Remember the rules? Let's try: What are the "things" of the riddle? Yes, the dog and the night. What is the action? Barking. Right? Combine them and there's another answer: Bow wow. Other creative answers: "The moon is shining." Or: sniff and say: "Here's a stinking dog around." Or just walk carefully: Step, step, step. Why? Don't ask. It just came in my mind. In normal life this kind of reactions on a question or a problem would be seen as childish or mad. In Zen it's a sign of maturity. For explanations of the rules on a personal level goto Zen Koans. Finding out how to answer a riddle or Koan can be time consuming, even if you follow my wonderful instructions. You may look for help by books that comment on Koans, one's smarter then the other. Don't hope for solutions, you'll only be showered with confusing Zen-talk. Traditional Zen-people insist on the secrecy of riddle and Koan solutions. They believe in decoding hundreds of Koans leads to enlightenment. Ok. Fine. Free Zen Riddle and Koan Service. Just send your Zen-riddles or Koan to me for a quick answer. Do you want more Koans and background stories? Here they are.